LOWA began when 18 local, state, & federal agencies joined together to hold several public meetings around the lake to gauge interest in starting a citizen led watershed group for the Lake of the Ozarks. This was because watersheds all over the nation were facing an ever growing crisis of pollution to watersheds, their native flora, fauna, and aquatic life as well as detrimental damage to the economic, social, and environmental health to these watersheds. LOWA’s creators were inspired to take a proactive approach to their watershed and its planning. LOWA was incorporated August 3, 2006. 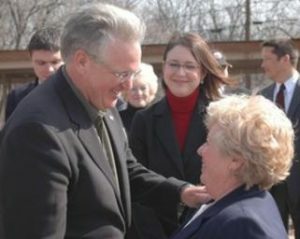 Missouri Governor, Jay Nixon and LOWA Executive Director, Donna Swall celebrate the largest ever funding for water quality testing at Lake of the Ozarks. As LOWA was formed, one lake area resident, Donna Swall stepped forward as the leader of this new organization and has led it to be one of only two Missouri watershed plans approved by the United States Environmental Protection Agency. Each of these elements is a vital part of the LOWA mission, and each provide a combined effort of direction and assistance to the watershed and its stakeholders. LOWA has worked tirelessly to promote their mission to keep our healthy lake healthy. The countless hours performed by volunteers and staff, as well as sponsorships and donations by individuals, businesses and community partners have all helped to make the LOWA mission possible. LOWA works to correct actions of the past, maintain the healthy lake, and promote smart future growth for generations to come.